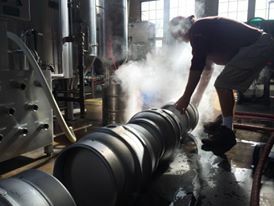 Do you want to be the brewer for a day at the Turkey Hill Brewing Company in Bloomsburg, PA? The Inn, Farmhouse and Brewing Co. at Turkey Hill had designed its Brewer’s Weekend Package just for you! 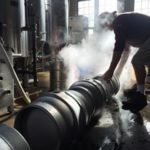 Spend a day behind the scenes at our brewery for some interactive hands-on brewing experience, learning about brewing techniques from mash-in to completion with our Head Brewer, Donny Abraczinskas, and Assistant Brewer, Tim Plisewicz. Of course, you’ll enjoy plenty of beer tastings and pairings, too! The package can be added to the cost of your room at our award-winning Inn in Bloomsburg, PA. It includes immersion in all things craft beer and ale, outstanding Brew Pub food paired with our artisan brews, a Brewers’ Dinner in our Farmhouse Restaurant, and a gift bag with some great souvenirs of your stay. If you’re partner’s not as anxious as you are to get the hops in your hair, we’ve got a list of other things to do, from wineries and galleries to shopping or outdoor fun. Friday night check into your room at the Inn and relax. Then meet with our brewers for an overview of Saturday Brew Day, plus enjoy appetizers and sample beers at Turkey Hill Brewing Company. Saturday begins at the Inn with a complimentary breakfast including a hot entrée if you wish. Brew day begins with Mash at 9:00 am and concludes about 4:00 pm. Lunch at the Brew Pub is included. Saturday evening gather back at the Brew House for a beer while you chat about the day, then adjourn to the Farmhouse Restaurant at the Inn for a private three course Brewers’ Dinner with paired brews. Sunday morning enjoy your complimentary breakfast at the Inn before departing with your Brewer’s Gift Bag including a limited edition engraved glass, official Turkey Hill Brewing Co. brewer’s shirt, limited edition growler, and a $25 gift card to help you fill it. The cost of the Brewer’s Weekend Package for two is $225 in addition to the cost of your room. Just give us a call at (570) 387-1500 and we’ll be happy to give you detailed information and reserve your package and your choice of room.